Invincible but deeply troubled “ THE WOLVERINE” finds Logan at his lowest point out of his element in a culture that he doesn’t understand. Darker, deeper and more exciting than any previous film featuring the clawed mutant, this time he has to confront lethal samurai steel, but also grapple with an inner struggle, coming to terms with his immortality. To celebrate the worldwide release of “The Wolverine,” 20th Century Fox and Robinsons Movieworld bring to the Philippines an unprecedented experience on how it’s like to BE THE WOLVERINE. Through the “Be The Wolverine” kinect technology, the complicated and thrilling action scenes in “The Wolverine” allows users to take part in an out-of-home interactive adventure that will be available in select Robinsons Movieworld branches starting July 19. The experience uses Kinect technology to register when fans walk by, scanning and activating a hologram to attract and invite interaction. On completing the experience, fans then have the opportunity to share their photo taking part via Facebook. Robinsons Movieworld, in its continuous effort to provide an interactive cinematic experience tours the “BE THE WOLVERINE” Kinect technology in prime cinemas: Metro East (July 19-21); Forum (July 22 -24);; Galleria (July 25 –27); Magnolia (July 28-30) and Manila (July 31-Aug.2). The experience is open to the public at no cost. 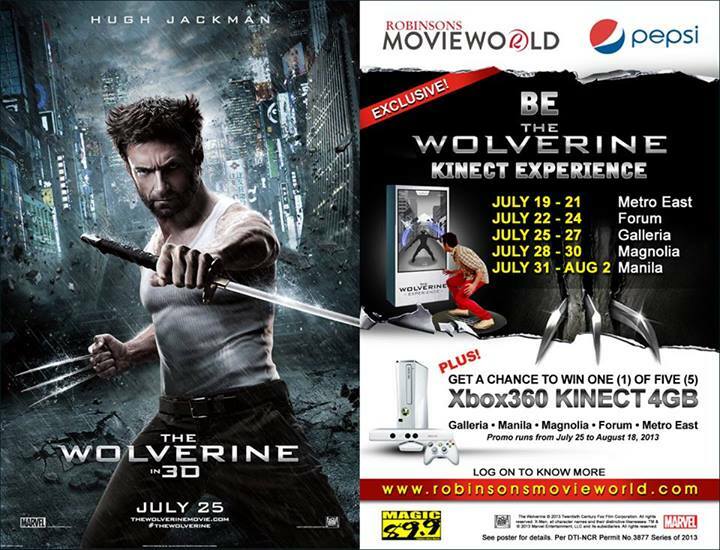 For the gadget-minded ones, Robinsons Movieworld is raffling off a total of five (5) Kinect consoles for every “The Wolverine” ticket purchased and any of the 16oz Pepsi products from the Cinema Snack Express. “Be The Wolverine” was created by Soap Creative, a digital creative agency focused on play-fueled, connected experiences across every screen with offices in Los Angeles, Dallas and Sydney. “The Wolverine” opens July 25 in more than 200 screens nationwide from 20th Century Fox to be distributed by Warner Bros.